You are here: Home / Blog / How-to & Resources / 7+ Ways to Save Money… When You Think You Can’t! I’ve been a saver since I was seven years old when my grandma opened my first savings account for me. My husband likes to poke fun at me because I know the exact price of everything we buy at Aldi, shop with weekly flyers, and use coupons whenever I can. I run searches for coupon codes for every online store. I regularly save 75% - 90% when I buy clothing, and I only work out at home so I can save money on a gym membership. Long story short? I’m really good at saving money, and I truly enjoy it! 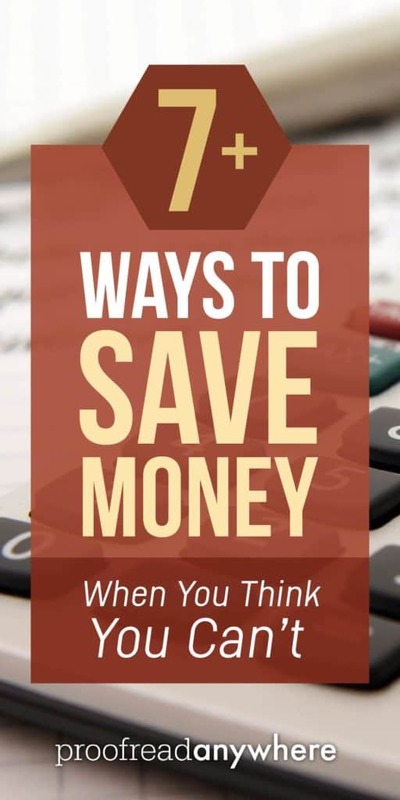 But even for the best of savers, there’s always something more you can do to save money. Always. I’m learning new stuff all the time! No one is the perfect saver, even if you started at age seven! So the tips and resources in this post are geared toward not the basic “save more, spend less” stuff you can find all over Pinterest, but the things that’ll take you to the next level. Maybe even the things that’ll take you out of your comfort zone a bit. Ready to Challenge Your Savings Habits? So are you ready to get serious about saving towards your dream? These are my best tips, resources, and free tools you can use to help “find the money” or save for just about anything — but especially for your self-improvement goals like up-leveling your skills and earning potential. After all, skills are the most critical factor for increasing your income. I challenge you to go through this list and ask yourself: Am I really doing everything I can to save? Or is there something more I can do to reach my goals faster? I recently signed up for a 100% free service called Digit, which securely connects to your existing bank account (just like PayPal does), studies your cash flow, and starts automatically pulling out affordable amounts each week based on that cash flow. It’s designed to help you save without even thinking about it! I’m so impressed with this service — and I’m excited to be setting money aside so I can treat myself in a few months to something I really want. I recommend Digit to ANYONE who wants to invest in something but think it’s out of their reach — just to see that it’s really not out of their reach. It’s the small amounts that add up over time that make those big things possible. Watch the video here. BONUS TIP: I’ve been using another free budgeting app called Personal Capital to track all my income, expenses, and even my retirement accounts — which is smart to do if you’re freelancing! It even emails me each week to tell me how much I spent that week in comparison to last week. Talk about accountability, eh?! I love it when it tells me I spent less this week than I did last week. This one’s easy. We all have to spend money, and chances are, we all spend some of it online. If you could put a percentage of that money you spend back into your pocket, would you do it? That’s what I thought! Ebates is an online referral service that enables anyone and everyone to get cash back on everyday purchases. I use it the most before placing orders on Vitacost (where I buy all my vitamins, energy bars, cleaning products, and baking supplies). Ebates will give you a $10 gift card just for signing up, and you can stack coupon codes on top of it. Vitacost always offers coupon codes, so I’m getting a consistent 10% to 20% discount on every purchase. I also love Ebates‘ browser plugin, which auto-activates the cash back when you’re on participating retailers’ sites. Then there’s Swagbucks. 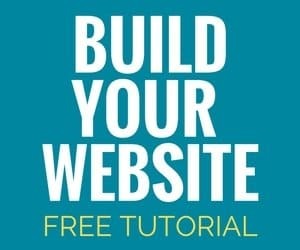 If you’re not already doing your Internet searches using Swagbucks, it’s time to get with the program! This neat search engine actually pays you just for using it. Run searches, watch videos, take surveys, and earn points you can redeem for free gift cards. 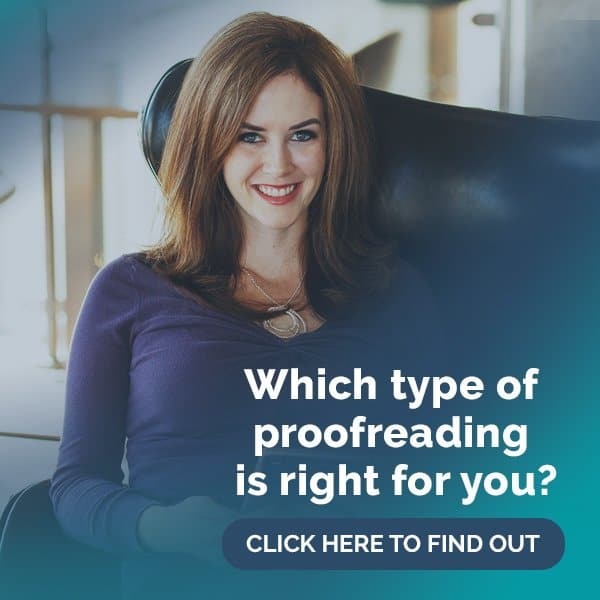 Proofreaders run searches for all kinds of stuff every day — to check spellings, case names, and to check addresses. And if you’re like me, you’re probably already watching tons of funny videos on Facebook, so why not get paid for it? I also save a ton of money by buying only gently used clothes on ThredUp which, on top of their rock-bottom pricing, always has a coupon code I can stack on top for even more savings. This is something I think anyone can benefit from because there is always something more we can do to save money at the grocery store. I recommend Living On a Dime’s amazing eBook, Dining on a Dime, which features more than 1,200 recipes that are designed to help you save up to $10,000 a year on groceries. WOW! What would you do with an extra $10,000 every year? Prefer to multitask? MoneySavingMom’s Grocery University is the most comprehensive audio course that promises to reduce the grocery spending of even the savviest of shoppers — or your money back! But at just $9.97, it pays for itself in a single shopping trip. Listen while you work. Probably the EASIEST way to save money grocery shopping is just to make more of your meals vegetarian. A lot of people believe eating meatless is expensive, but that’s only true if you replace your meat with expensive meat substitutes. BUT if you replace your meat with beans or lentils, you can save a ton of money — automatically! — because beans and lentils are incredibly cheap, not to mention packed with fiber, antioxidants, and protein. It doesn’t have to be just a boring pile of beans on your plate, though! This list of 101 vegetarian freezer meals proves that eating vegetarian meals is not only cheap, it can also be delicious and save you lots of time too. If going vegetarian isn’t quite your thing though, there are still other options. Erin over at $5 Meal Plan designs weekly meal plans for your family and you. Complete with a grocery list, a menu, and recipes, her meal plans let you feed your family tasty meals all while saving money! She even has gluten-free menu options. I gave up my iPhone in July and haven’t looked back. I still have an awesome smartphone with Project Fi, but I’m saving over $120 per month between me and my husband — just by not having an iPhone. That’s $1440 every year and, if I plan and save carefully, the money I save by not having an iPhone will grow to more than $21,000 in 10 years. HOLY COW. If that doesn’t convince you to give it up, I don’t know what will. Here’s a copy of my October bill from Project Fi, just in case you think I’m pulling your leg. It’s $28.52! Project Fi offers you the option of having a smartphone without a data plan, or with a data plan that includes only the data you actually use — starting at just $15 per month! 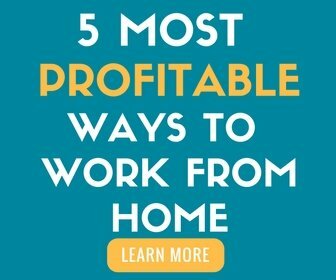 If you work from home like me, simply use your Wi-Fi instead of data to save major cash on data charges. I use less than half a GB of data each month! Can’t give up your iPhone or carrier? Then consider buying refurbished phones instead of new ones. My students use sites like this one to purchase certified refurbished iPhones and iPads for their proofreading businesses. ALL of my iPad purchases have been refurbished units. It’s such an easy way to save an automatic 15% or more on your tech devices, and you can sell your old ones too! I have friends who lease new cars every three years, pay for everything on credit, complain about being broke, yet still pay $200 per month for cable TV. Seriously!? I’ve never had cable. Ever. I used to watch Nickelodeon at my grandma’s house growing up, and my parents had satellite, but since I’ve been out on my own the last 10 years or so, I’ve never paid for cable. I still watch TV, but I watch it on Amazon Prime (for movies and past-season TV) and Hulu (for current shows) instead. It’s a great bonus in addition to the free two-day shipping, and the iPad app allows you to download episodes to your device (!!!) so you can watch them without WiFi — great for flights!! Did you know Amazon Prime also offers free streaming music?! I made a playlist for my high school reunion this year using all songs I found in the Prime Music library. How much cash do you have sitting around your house or in your garage — in the form of collectibles, unused treadmills, old smartphones, even cars — that’s just gathering dust? My friend Robbie — seriously; he lives 30 minutes from me — earns more than $40,000 per year by buying in-demand items from flea markets and thrift stores at rock-bottom prices, then “flipping” those items for jaw-dropping profits. One time he bought, repaired, and sold a pair of jet skis and made a $17,000 profit! He and his wife Melissa have three young children and are able to support their entire family every month on just their flipping profits. Flipping is something anyone can do! Robbie writes an awe-inspiring blog where you can learn more about exactly how he does what he does — including the exact apps and tools he uses to make it happen. Your Takeaway? A Dollar Saved = A Dollar Earned! Saving money isn’t a step down from earning money. Saving money, in my opinion, is equal to earning it. It takes skill to save money just like it does to earn it. A dollar saved is a dollar earned! The way I see it is that each dollar you save, you can put those dollars back into your pocket — or towards something that will improve your life in some way. Onward and upward! Are you looking to change your saving/spending habits so you can up-level your skills and earning potential? Got any tips to share? Comment and share your story below! Thank you so much for sharing the Gazelle site, Caitlin! Awesome to know that a used IPad is an option when the time comes! Thanks so much for sharing these sites. Some I knew about and some I did not. Always looking for ways to save money! There is another app similar to Digit that you mentioned called Acorns. It invests small change amounts from each of your purchases, so you are spending whole dollar amounts. I also want to mention to anyone looking to make some extra EASY money that Amazon has a survey/task website called MTurk where you can have the money you earn turned into cold hard cash in your bank or use it directly on Amazon.com. I started using it this year only occasionally and have $70, it really pays out, unlike some other survey sites I had tried before. Any ideas on how to get internet service cheaper? Since I don’t bundle with cable or a phone it is now $73/month which is outrageous. If you call them, you may be able to negotiate a lower rate. You can probably find scripts online pretty quickly. It’s worth a shot! My MIL just did this with her bundle service about a week ago, but I’ve never done it myself. Great information, Caitlin! Indeed, if I save a dollar, it’s just as if I had earned one. 1. Saving on cable: We left *Direct TV (and a $90.00/month bill) almost four years ago and haven’t looked back. We have absolutely no regrets. I purchased a digital antenna for $89.00 (one time), a Roku streaming device (one time), and subscriptions to Netflix and Hulu Plus. Net monthly savings is about $72.00/month x 4years = (almost) $3456.00 saved over four years. Sweet! 2. I started doing surveys online a couple of years ago and then just quit. I was spending too much time for very little return. However, I recently found two that are different. One is called, “e-Rewards” and the other is “American Consumer Opinion.” Both seem to be well worth the time spent. *One interesting note about our Direct TV experience: We thought we were getting true HD on many of our channels for all the years that it’s been available on Direct TV. No, we were not! However, we now get some of the same channels through the antenna, but they ARE in true HD; what a difference! Apparently, since we opted OUT of their more expensive offerings, Direct TV had been “dialing back” the quality of our signal. Who knew?! Whew! Thanks for the heads up on DirectTV. I have a Roku too and LOVE it! I rip all my workout DVDs to mp4 and play them thru Roku. Sure beats popping in DVDs all the time! My credit union has a savings account called Easy Saver. Each time you use your debit card it automatically rounds your purchase amount up to the next dollar and deposits it directly into your Easy Saver account. Since May of this year I have about $90 in my account. If I use my card to get gas, I will pump until I go over by 1 cent, and then I have 99 cents deposited in the account. If you live in the Dayton, Ohio area, you might consider opening a checking account at Wright-Patt Credit Union. I think they have branches in Columbus and Cincinnati as well. As a member of Wright-Patt Credit Union, you will also earn dividends based on your account activities and average balances. Thanks to everyone for these ideas. They are all useful. Love this article!!! Seriously going to delete my cable now and sign up for Amazon Prime!! Monica, you may seriously want to look into purchasing a digital antenna. It’s a one-time expenditure but will allow access to all your local stations … many in true HD. It’s about $90 on Amazon but worth every dime. There are some cheaper ones, but you may sacrifice the number of stations you’re able to pick up. I bought this antenna four years ago and currently receive 29 unique stations. Of course, yours may differ, depending on location. Click on “Coverage Lookup” and then “My Current Location” on the drop-down. Wishing the best to you. Love this, Caitlin! I use most of these tips and tricks, but Digit and Project Fi are new to me. Thanks for this article!! It is crazy how few people have heard of Project Fi! I looooove my phone. It gave me a map of the mall I was in yesterday! Thanks for the tips! I’ll have to look at some of these websites. $1,500. I bought an Obi box, and still have a cordless phone to talk on. I have a phone that I could use on Project Fi, but I don’t think I would save money since I love to stream music in my car. I don’t use any data on my current plan doing this. Wow, what a lot of information is shared here! Thanks everyone! I already buy the oldest iPhone to save some money, I never thought about giving it up altogether to save money. What a great idea. These are all great ideas. I may give Digit a try too. Thanks, Katie!! Sometimes I do miss the fancy new iPhone euphoria, BUT then I look at my Project Fi bill and just smile ear to ear. It’s SO satisfying to save that much cash — especially on unused data every month. I also love that it just WORKS when you go overseas.